A combination of basil, oregano and macadamia nuts make a versatile ingredient for appetizers, soups and pasta. I had a bumper crop of oregano in my garden this year so I decided to make a pesto sauce combining both oregano and basil. Pine nuts just happened to be in short supply during my shopping trip so I decided to substitute macadamia nuts. I liked the result a lot and my just make macadamia a permanent substitute in my pesto recipes. Place macadamia nuts in a dry saucepan over medium high heat. Roast nuts, stirring constantly, until they are lightly toasted. Remove from heat and allow them to cool for a few minutes. Transfer nuts to a food processor and add garlic, salt and pepper. Pulse until nuts are finely ground. Add basil and oregano leaves and process until mixture is smooth. While processor is still running, slowly pour olive oil into the feed tube until fully incorporated. Add cheese and process until smooth. Transfer pesto to an airtight container and pour a thin layer of olive oil on top. Store in the refrigerator until ready to use. This pesto is a great flavoring ingredient in soups, pastas and other main dishes. 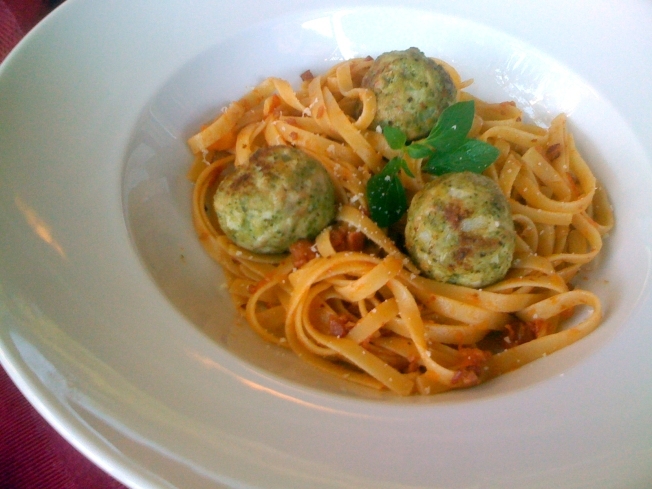 The meatball recipe below is great as part of a pasta dish. But, you can also make the meatballs half the size described in the recipe (doubling the quantity) and serve them as appetizers. One of my favorite sandwiches is made by tossing pre-cooked chicken breast in a small amount of pesto, slicing the breast and adding slices of fresh mozzarella and tomatoes to make a sandwich. Preheat oven to 350 degrees F. Mix ingredients together in a large bowl. Form mixture into 14-16 meatballs, about 2 tablespoons in size each. Place on a baking sheet and bake for 20-25 minutes or until cooked through (internal temperature should be 165 degrees F). If you want a rounder meatball, you can turn them a few times during the cooking process. Just before removing meatballs, heat 1/2 tablespoon of olive oil in a large saucepan over medium high heat. Remove meatballs from oven and toss in saucepan to quickly brown them. Serve with a lightly seasoned pasta (see recipe below). This simple dish takes a little time. Don't rush it. Keep the temperature low and be sure to stir often. Heat olive oil over medium low heat in a saucepan. Add bacon and sauté until tender, about 5 minutes. Add onions and continue to sauté for an additional 5 minutes, stirring often. Reduce heat to low and continue to sauté ingredients for 30 minutes, being careful not to let ingredients burn. Add tomatoes and continue to sauté, stirring often, until ingredients have fully incorporated, about 20 additional minutes. Meanwhile, prepare pasta according to package directions, timing it to be ready when the sauce is ready. If sauce is a bit dry add a small amount of the pasta water. Drain pasta and mix into the sauce mixture. If you are serving this dish with the meatballs above, mix them in as well. Divide mixture into four servings and garnish with a bit of basil or fresh oregano. Offer your guests freshly grated Parmigiano-Reggiano to top off the dish.